A double-century in a one-day international is not quite passé, but has become more common than ever seemed possible. A double-century in a World Cup quarter-final? That is something truly special. 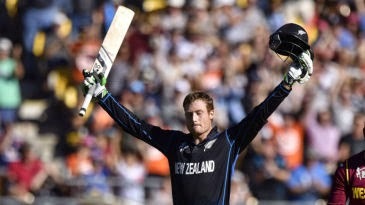 Martin Guptill's unbeaten 237 was the highest World Cup score of all time and the second-highest in all ODIs, but most importantly it ensured New Zealand's progression to the World Cup semi-finals for the seventh time. Nobody in the partisan crowd in Wellington will ever forget Guptill's innings. Nor will Marlon Samuels, who in the first over of the match grassed Guptill at square leg. It is hard to imagine a costlier one-day drop, for Guptill went on to score 60% of New Zealand's 393 for 6. To add to the hurt, Samuels later fell to the most brilliant of catches, when a backpedalling Daniel Vettori at third man leapt and pinched a one-hander above his head that would have gone for six.